Ah! No other food in this world creates the unique flavors of smoked sausage. Unfortunately, it can cost more than you might like to buy from a shop. That's because it takes a lot of time, effort, and skilled seasoning to get that delicious and mouth-watering flavor. However, you can save yourself a lot of money on this process by smoking summer sausage yourself and creating a unique tweak on this meat recipe. 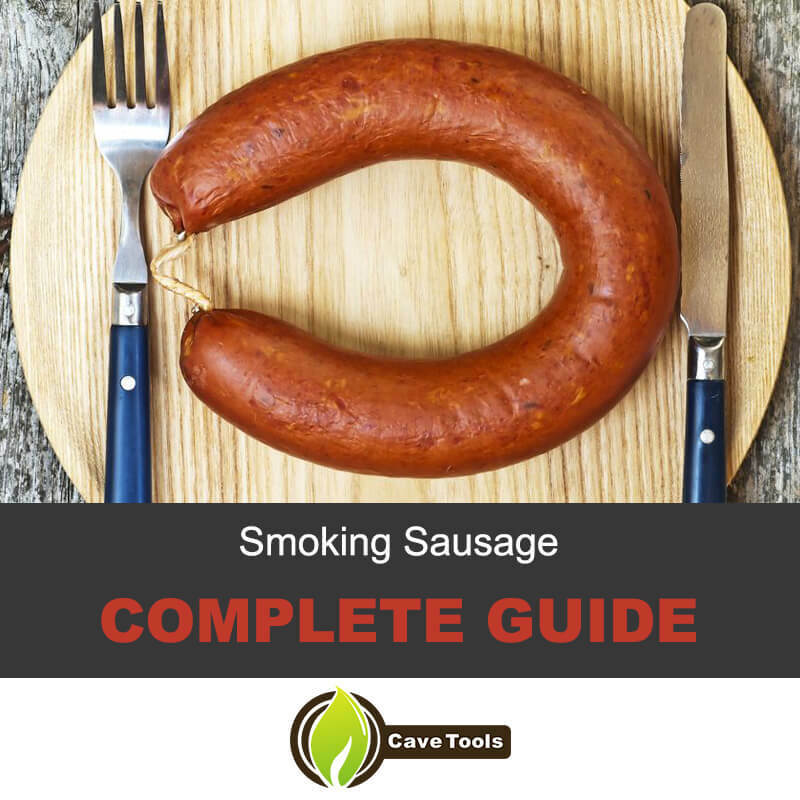 In this complete guide to smoking sausage, you will learn what kind of items you need to produce delicious meats and how to perform the smoking process on your own. Each section will give you very detailed information on how to achieve this goal, providing you with the inside scoop on smoking some of the most delicious sausages you'll ever eat. So if you're ready to prepare and eat the best and most delicious smoked sausage ever, let's get started. Even if you have to invest a little bit of money in the initial steps of this process, you're going to be glad that you did. There's nothing quite like the feel of biting into your homemade smoked sausage or giving it out to friends and family members for birthdays or as Christmas presents. Wood Chips – We'll help you choose the right type in the section below. Bowl of Water – Important for soaking your wood chips before smoking. Smokehouse – Critical for producing that delicious smoky texture. Various Types of Meat – The exact meats you choose will vary depending on your taste. Measuring Cups – These are critical for mixing in your meat spices. Spices – Choose whatever spice sounds great to you, though cure is a popular choice for smoked sausage. Sausage Casings – Your meat has to be placed in these casings in order to keep the proper shape. Thermometer – Important for gauging the interior temperature of the smokehouse and the sausage. Now that you know what you need for the smoking process, you can get started on it right away. The techniques you use for smoking sausage are easy to learn but challenging to master. The steps here should give you a good start and the opportunity to tweak everything to meet your needs. 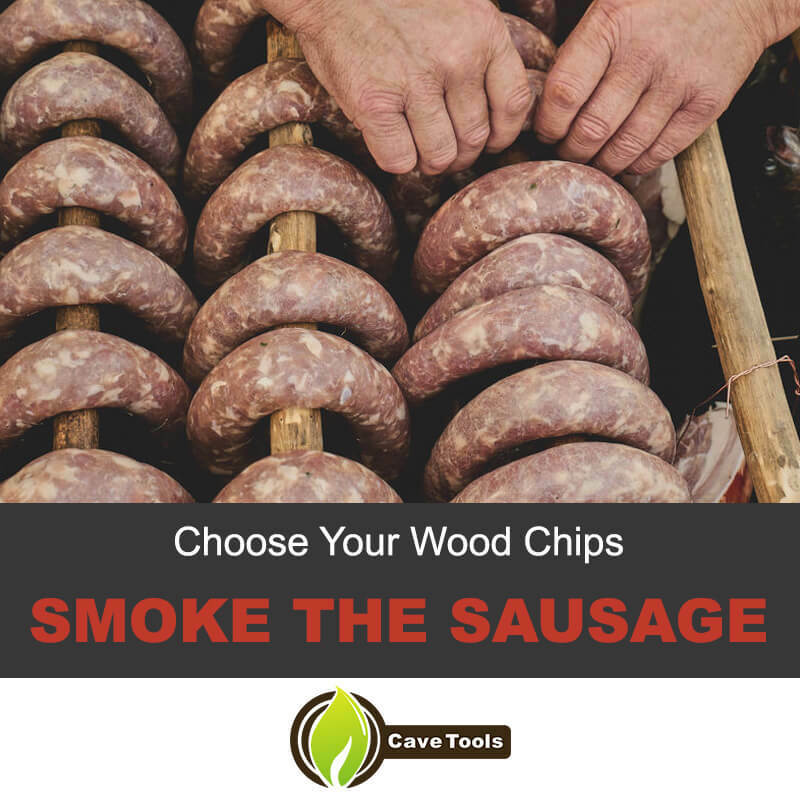 The first thing you need to do is pick the wood chips for your smoking process. The type you choose depends on the flavor you want to produce. If you want a light and rich flavor, you should choose fruitwood and smoke your sausage for at least 3-4 hours. However, those who want a stronger and more memorable flavor should choose mesquite or hickory chips. These chips are richer in wood taste and create a variety of different textures and flavor variations. When using them, you must smoke your meat for at least 3-4 hours. Did you buy a smokehouse before you started this process? If not, you need to find a place where you can smoke your meat. A full-sized smokehouse is often a large outhouse-sized building where you can control the temperature of your meat. This type is a good choice if you have a lot of property on which you can prepare and cook your meat. However, you don't necessarily need a full-sized smokehouse. Some people will build or buy smaller smokehouses that they can fit in a kitchen or even their pantry. These smaller smokers are usually cheaper and produce a more concentrated smoky texture in a shorter period. Many counter-sized units are available, which are a good choice if you're new to smoking and aren't sure if it is right for you. Before smoking with your wood chips, they must be soaked to maximize their smokiness during the cooking process. Place your chips in a bowl of water for at least 30 minutes before smoking to achieve a light smokey flavor. However, you can also smoke them for a little longer if you want them to create a richer and smokier texture. Before preparing your meat, you need to decide how long you want it to smoke. You're going to hear a lot of different suggestions online. For example, you might find that people are suggesting smoking anywhere from two hours all the way up to 20 hours. The trick is to find a balance for the right amount of smoke flavor. You also need to achieve a specific internal temperature with the meat. Some people aim for 155 degrees Fahrenheit, which creates a pretty tender sausage that only needs to be smoked for about 2-3 hours. 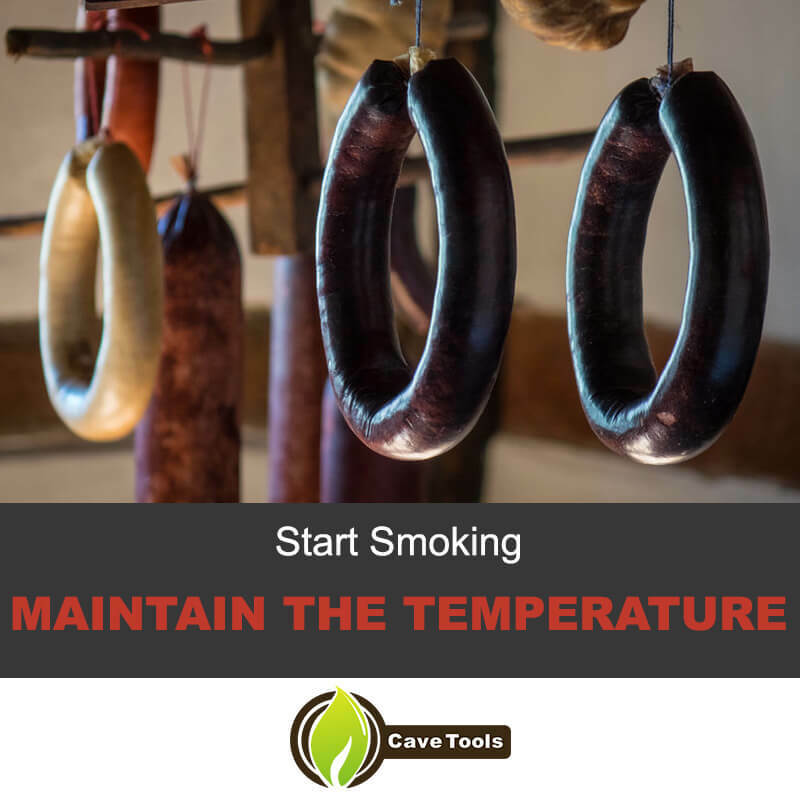 However, others will smoke for more extended periods (between 8-14 hours) at lower temperatures and pull the sausage when the temperature hits 175 degrees Fahrenheit. This temperature range will create a somewhat crispy and smoky texture and is right for those who want their meat to have as potent of a taste as possible. Here comes the most critical and creative part of the smoking process. You need to create a mixture of great meat and spices that enhance your smoked sausage experience. Most people will use pork and pair it with milder meat, like beef, to enhance the flavor profile. Others will prefer tangy and gamey venison paired with beef or pork. Create a balance that meets your unique taste before choosing your spices. This step is going to decide whether or not your meats are great or mediocre. Spices such as ginger, bay leaves, paprika, cayenne, salt, cumin, thyme, and fennel are all popular when making smoked sausage. Some even like mixing in fresh chopped garlic or dehydrated chopped onions. When you've chosen your spices, you need to mix it with your meat and then press it into sausage casings. Tie off the casings every 3-5 feet and cut them off to create easier-to-smoke lengths. You're now ready to smoke! Now that your meat is ready and your wood chips are soaked, you can start smoking. Place your wood chips in the smokehouse and set the chips on fire. Keep the dampers on the side open to increase the temperature to at least 160 degrees Fahrenheit. Once you've reached this level, close the dampers and hang your meat on the smoking racks. Give them a few inches of room on each side to avoid cooking them together. Make sure that the temperature of the smoker stays at a consistent temperature during the smoking process. You're typically going to have to replace the wood chips every 90 minutes to keep the temperature intense. Changing them also ensures that your sausage gets a maximum amount of smoke flavor. Continue this process for anywhere from 3-14 hours, depending on your preference. Every time you replace the wood chips, check the interior temperature of your sausages. You want a minimum temperature of 152 degrees Fahrenheit. That ensures that all the bacteria is killed. However, you can let it reach higher temperatures if you want it crispier. Don't let it top 170 degrees Fahrenheit, though, as any higher will ruin the sausage texture. After your sausage has reached the appropriate temperature and the brown texture you want and you've removed it, place it in cold water to cool it down. Do it as quickly as possible to prevent any shriveling or shrinkage. Don't listen to people who say you need to cool your sausage slowly. Doing it that way will only decrease its quality. Make sure you step back when you throw in the sausage, though, as its going to create some steam. Once your sausage has cooled down, you need to find an area where it can hang for at least 2-3 hours. This area should be at room temperature to ensure that your meat cools down properly. An extra room in your house is a good place to hang your meat, though it should be safe from flies or any other pests. And make sure that you don't hang it outside to cool. That might seem easier to do but will only open it up to invasion from insects and even passing animals. Any neighborhood dogs or raccoons are going to feel like they died and went to heaven when they see that hanging sausage so easily within their reach. Once your smoked sausage is properly cooled and dried, cut it into one-foot rings and tie off the ends to make it easier to store. Wrap each ring in wax paper and refrigerate. You can also freeze them if you plan on selling, giving away, or eating your sausage later. Frozen sausage is usually good for about 9-12 months. It won't go bad after a year has passed but may start to lose some of its flavors. Hopefully, you learned everything you needed to know about how to make sausage. We tried hard to make this article as informative and as entertaining as possible. If you enjoyed reading this complete guide to smoked sausage, we think you should send it to any friends or family members who you think might enjoy it. In that way, you can all make great smoked sausage and share it together. And that's the critical part here. Teaching people how to make delicious smoked sausage can create a whole new world of great food that you can eat on your own, give away, or even sell. If you have any questions or comments about this process, please don't hesitate to let us know in the comment section. We will reply as soon as possible. ​Unlike raw sausages, smoked sausage is ready to eat out of the package. This type of sausage is fully preserved using curing, drying, and/or smoking techniques. 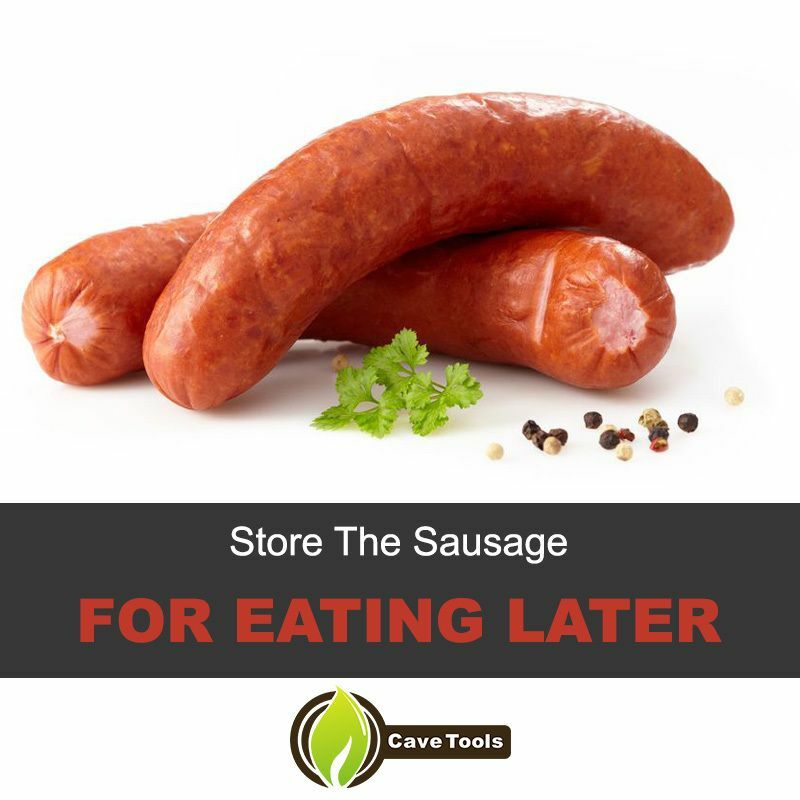 You can cook smoked sausage before eating it to deepen the flavor, but you can also slice a piece off and eat it right out of the refrigerator. ​What Can I Make with Smoked Sausage? ​The possibilities are endless with smoked sausage! You can use it as the base for soups and stews, such as gumbo or red beans and rice. You could also use it as a stir-fry ingredient for making skillet meals. It makes an excellent topping for barbecue fries and it’s delicious when served on top of cheesy polenta. Use it in potato salads, baked beans, or even serve it up on its own with sauteed peppers and onions. ​What’s the Difference Between Smoked Sausage and Kielbasa? ​Kielbasa is a type of smoked sausage, but not all smoked sausages can be called Kielbasa. Smoked sausages can be made from any type of meat - beef, pork, chicken, turkey, alligator, duck, etc. Kielbasa is a traditional Polish sausage that’s usually made from ground pork and spices. ​What Temperature Do You Cook Smoked Sausage? ​When you’re smoking your own sausage, you want to cook the meat to at least 150 degrees F. Depending on the type of meat, you may want to go up to 165 degrees F (as would be the case for poultry). Don’t let the temperature go above 170 degrees F, as this can dry out your sausage. ​How Long Does it Take to Smoke a Sausage? ​Since sausages are not very large, they don’t take long to cook! It will take 30 to 90 minutes to fully smoke your sausage, depending on the temperature of your smoker and the size of the sausage itself. Try not to smoke your sausage too quickly, as this can cause the casing to shrink.